1. Put egg yolk and seasonings in a basin. Mix really well using a wooden spoon. 2. Add oil, drop by drop at first, stirring briskly with a wooden spoon. 3. When very thick add a teaspoon of vinegar, then remaining oil a little more quickly, then beat in rest of vinegar as required. it should be thick enough to hold the impression of the spoon. 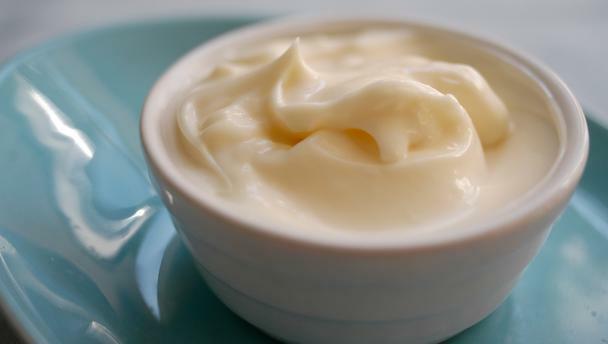 Beat into the finished mayonnaise 2 teaspoons of lemon juice or 2 teaspoons of cream.